Once an organization gets some traction in their market, over the hump of cash flow and all that, the next biggest trap is the incredible opportunities. As your company grew, everyone said, “You’ll never make it,” but your company did. Who is to say that your company cannot be successful at all of the other opportunities staring down at you? Sometimes, the most important decisions that you make, are the decisions about what not to do. The growing organization needs to focus its efforts on becoming more successful at their core business. There will be plenty of time, later, to chase down that incredible restaurant deal or that mail order pharmacy company. Disciplined focus, execution, not opportunities. Stay out of the trap. This entry was posted in Strategy and tagged discipline, focus, opportunity, strategy on March 2, 2018 by Tom Foster. “You have two out of five manager positions in place on a daily basis, so when you have a problem, you fix the problem, but not the system,” I offered. “So, the problem is fixed,” Derrick insisted. “Yes, the problem is fixed, but the system is still broken. You are missing three of five Managers, so you are not paying proper attention to your systems. “You see, Derrick, when you have a problem, everyone scrambles to fix the problem. Even experienced Managers put on their superhero cape and leap in front of their biggest customer to save the day. 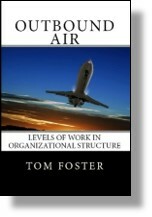 This entry was posted in Accountability, Systems and tagged focus, manager, role, system on April 10, 2012 by Tom Foster.